Tanya sits on a low wall at the bottom of her garden, and she's already swigging from a bottle by the time I reach her. She's picked the label off so I've no idea what it is but it's pink and smells like floor cleaner. She hands it to me before I've even sat down. "What are we doing here?" I ask her. She sent me a text earlier telling me to get down here before it gets properly dark but wouldn't tell me why. I can't help thinking she just wants to get drunk and brag about the stuff she's done with Mickey Tunnock. "Found out summat int'restin' today," she says. She's already slurring and her eyes have that glassy, faraway look. "What?" I pretend to take a swig from the bottle but I keep my thumb over the neck. Tanya doesn't even notice. "This 'ere, this bit o' road, it's a corpse road." Tanya gestures to the rocky path that runs along the bottom of the garden, disappearing off through the fields. "Corpse road. People din't get buried at church, so they had to get carried along 'ere," says Tanya. I look along the path, and think of the number of times I've used it as a shortcut to get to Jake's house. Tanya fishes around in her inside pocket and pulls out a battered packet of cigarettes. She's probably pinched these from her dad along with the pink rubbish in the bottle. "Found out from one of them church lot in the village. Figured they'd frighten me into behavin' or summat." Tanya smiles but it looks more like a leer. "So why are we sat down here?" The air's getting cold and I've just realised the stones are slick with damp. "Told Mickey 'n he said he already knew. But then, get this, he says that if we sit 'ere on a full moon, we'll see a ghost." Tanya wiggles her fingers and makes childish ghost noises. I roll my eyes. "And you believe everything Mickey tells you?" "Most of it." She giggles, no doubt remembering something filthy he's told her. I pass back the bottle and she takes another swig. I look up at the sky and notice it's a full moon. I can't remember the names of the other phases but there's no mistaking this one. I doubt we'll see a ghost, although Tanya will be seeing all kinds of stuff if she keeps drinking that pink stuff. When I look at Tanya again, she's slumped against the tree by the wall. She's snoring gently, her mouth open and her eyes flickering. I'm half tempted to take a photo to put on Instagram but I notice something more interesting. People are coming along the path towards us. There are only about six of them, and four of them are carrying a box. It's long and thin, but wider at the top end. There's no mistaking what that is. The two at the front walk with their heads bowed. What's really weird though is that I can see through them. I consider waking Tanya but I'm scared that the noise she'll make will ruin the illusion, and the vision will go away. I know I should be scared, but I'm not. All I can think of is I need to take a photo or no one will believe me. I fumble with my phone but the camera app won't load. I jab at the icon several times, knowing the people are getting nearer, and when the app finally opens, all the screen shows is static. I groan in annoyance, and look up in time to see the people drawing level with us. One of the figures at the front finally looks up, and she stares me full in the face. I stare back, unable to believe what I'm seeing. I fall backwards off the wall and hit the ground with a thump. Only one thing springs to mind before I pass out. The girl who looked at me is my absolute reflection. Image originally by Nigel Chadwick. Edits by me. 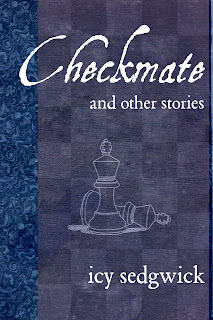 I've had three self-published e-books available from Amazon for some time now; The First Tale, which collected the episodes of my web serial into one steampunk story, Checkmate and Other Stories, which collected the first fifteen stories that I'd had published online, and Dead Man's Hand, a trilogy of short stories which served as a prequel to my pulp Western, The Guns of Retribution. Well Guns has a new cover thanks to its re-publication by Beat to a Pulp, and I've been working on putting together a second collection of the stories I've had published, and between the two, I decided to reformat Checkmate, and give it a new cover. The actual content hasn't changed at all, aside from being formatted in InDesign instead of Word, but it's got a brand new face! What do you think? I'm hoping to stick to this sort of style for those books I put out myself, so The First Tale will be getting a facelift as well (it was published in 2010, after all!). This is part experiment, to see if a new cover helps to boost sales, and part of my own fascination with all things design-related. 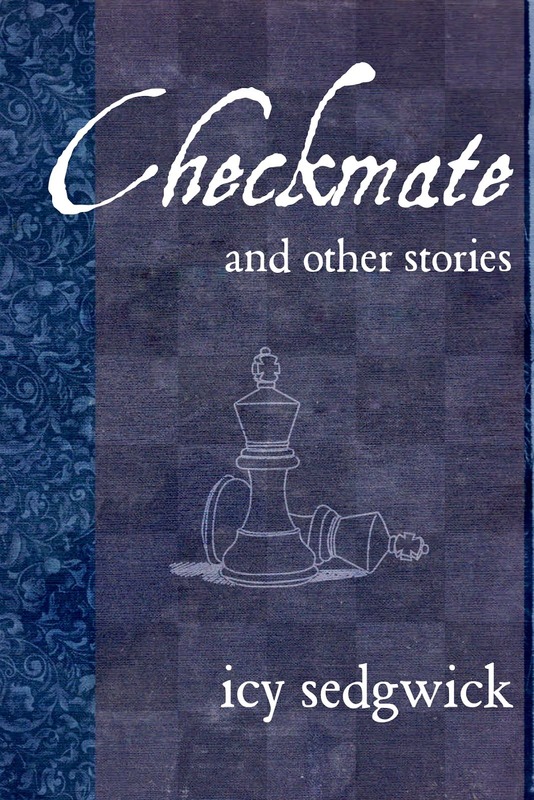 Checkmate and Other Stories is still just 99c, or 77p, and is available from Amazon and Smashwords (so you'll be able to grab a copy if you don't have a Kindle). The next collection, Harbingers and Other Stories, will hopefully be out in October!